Fairmile Vineyard was delighted to be invited to contribute to the Henley In Bloom entries for the four years between 2014 - 2017 – both at Regional, National, and International level. We were proud of Henley’s being the only UK town put forward in 2015 by Britain In Bloom to enter the EU equivalent - Entente Florale. The town went on to win Silver - just two points away from Gold. In Spring of 2018 we supported the creation of a community orchard on a piece of land owned by the Town Council between Paradise Road and Leaver Road, where we supplied Müller Thurgau Germanic wine-making grape vines, labour, trellising and expertise. In September 2018 we were humbled and delighted to hear that, within their first month of release, or wines had won gold and bronze medals during the Thames & Chilterns Vineyards Association wine challenge. 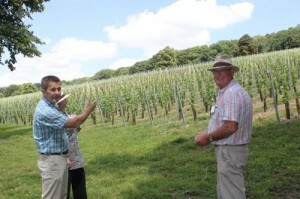 Rotary Club of Henley Bridge members were delighted to welcome viticulturist Jan Mirkowski, owner of the Fairmile Vineyard in Henley, to give a talk.